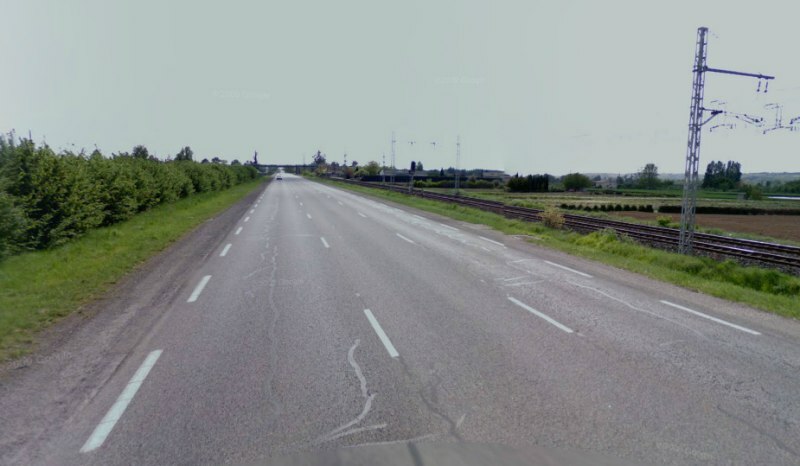 A while back as I was cruising around Google Street View (via Classygmaps which can still be accessed here: http://gokml.net/maps), it occurred to me that I have never seen a two way left turn lane outside of the United States or Canada. It also got me thinking about the history of two way left turn lanes, when, where and how they first came into use in North America. I did a search and as far as I can tell, this specific subject has not been addressed on this sight before. I also attempted to Google search this topic however even adding the keyword "history" to the search bar only got me lots of links to various DOTs left turn lane practices and news stories concerning current local issues, etc. Does anyone have any light they can shed on this topic? I've never encountered a marked two-way left turn lane in Mexico, having driven in five states and traveled by intercity bus in another. I seem to remember seeing one on GSV and being surprised at it, but I can't for the life of me remember where it was. 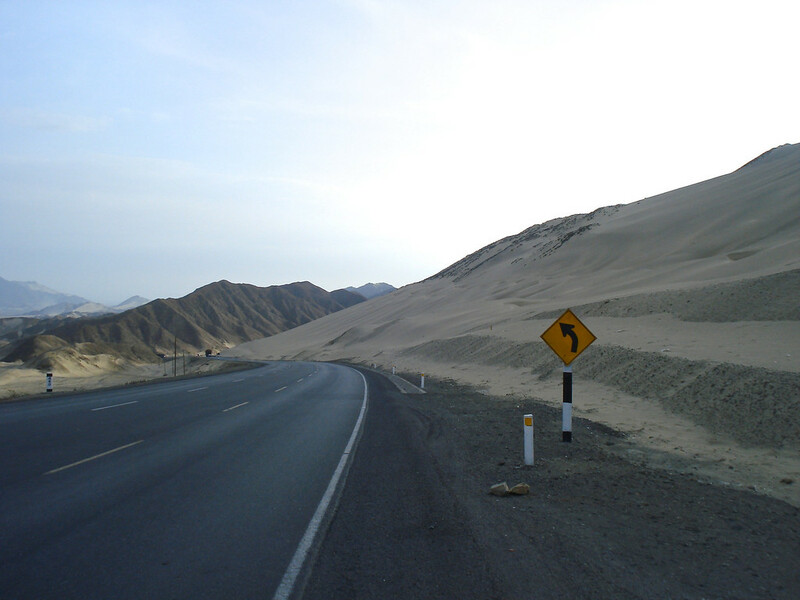 What I have seen in Mexico is a wide paved median with no markings—which basically functions the same as a TWLTL. Here is a good example south of Monclova, Coah. I seem to recall reading that they were initially designed as two-way passing lanes. After that became dangerous, they were redesigned to become either through lanes, or neutral space for turning only. EDIT: Washington's 1965 law manual states that center lanes were for both turning and passing (~23.2) but I don't know if they were built to accommodate both, or if one of those uses came later. I recently read the history of The Pulaski Skyway, and how it had a center lane that was meant as a breakdown lane, but motorists were using it dangerously as a passing lane. Also, are new ones really being built anymore? I'm not talking about short ones that only last a few thousand feet for small businesses, but the ones that go at least a mile or so. NJ has added them as part of road diets, changing a 2 lane per direction road to 1 lane per direction plus the 2 way center turn lane. PennDOT still uses them often. Four lanes and a center turning lane is standard for widenings in Montgomery and Bucks Counties at least. They're rarely if ever built on long-distance rural stretches. Existing examples of this (US 422 Hershey-Reading, US 222 Reading-Allentown, US 30 Lancaster-Coatesville, US 11 south of Carlisle, etc.) 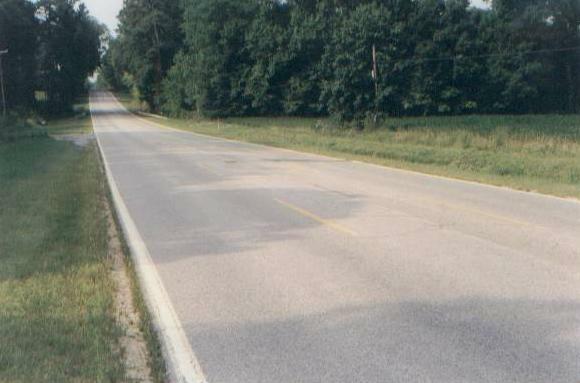 are former two-way "suicide lane" passing lanes. I've seen 4-lane roads downsized to TWLTL operations. More recently, though, I've seen agencies opt for a landscaped or grassy median with periodic left-turn bays instead. I've seen 4-lane roads downsized to TWLTL operations. I agree with this. It's being done around here now an then.....I'd have to review the plans, but I'm pretty sure Liberty Ave (here in Pittsburgh) is going to have this done in the near future between the downtown and Bloomfield neighborhoods. In Vancouver, a lot of main arterial roads have long stretches without any turn lanes. For the most part, the inner lane acts as the turn lane, the center as the through lane, and the outside lane as a triplex of right turns, through movements, and parking. In metro Seattle, four lane roads are not common. Most roads are either two lanes, two lanes with a center merge/turn lane, or five lanes with a center merge/turn lane. Very few four-to-three conversions as has become common practice elsewhere, but mostly because the roads around here were frequently designed for that center lane at the beginning. There have been a few conversions; in one case, a lane was taken from one direction and turned into the merge/turn lane, rather than shrinking both directions and adding bike lanes. Overall, the TWLTL has become more common, though medians and U-turns are certainly gaining popularity. I think it depends on the region. They seem to be very common out west, though in my time driving back east, they don't seem as popular (medians and turn pockets being preferred). Philadelphia Pike, Claymont before road diet and after road diet. "If a roadway is divided into three lanes and provides for two-way movement of traffic, an operator on the roadway may not drive in the center lane except:... if passing another vehicle and the center lane is clear of traffic within a safe distance..."
This applies only to three lane roads, and I've never seen a center lane that wasn't marked for left turns only or as a passing lane dedicated for traffic in one direction. I don't remember seeing any new long sections of left turn lanes built, but I also don't remember seeing any new roads that might use that kind of lane being built. I've seen a few left turn lanes taken away and replaced with a median with occasional left turns. This reduces the frequency of potential conflict points and eliminates head-on traffic in the turn lane. To me, that's worth the small inconvenience of having to go past your destination and turn around. It also eliminates a problem caused by people who don't know how to use the lane when it's a one-way left turn lane. In some places it's common for someone to use the lane to the left of the double yellow right beside a traffic signal when the lane is meant exclusively for traffic in the other direction, approaching the signal. In that case you should turn left from the regular left lane if you can do so with haste, or go past and come back so that your destination is to the right. I've seen one intersection where a raised concrete median was put in for a short distance specifically to fix this problem. I've seen many laws like this, but I can't recall actually seeing a center lane that allows passing. All the ones I'm aware of has black on white regulatory signs limiting the center lane to left turns only. Virginia had this set up all over at one point. This concept used to be moderately popular in Europe, specifically the first generation of Autostrade in Italy which were 3-lane, limited-access highways. Most of them were eliminated or twinned by the 1960's. It was also found in France and Belgium, and there are still a few left here and there. resurrecting this thread to show a suicide lane still in active use as of several days ago. photo taken in Peru by a motorcycle adventurer named John Downs - I don't think he'd be too objecting to me using his photo here. I used to work where to go home I had to take a left onto a two-way left turn lane on a busy street, and to the left of there was a gas station that traffic would pull into the TWLTL to use. Even if traffic from the left was clear, I couldn't trust that someone wouldn't speed into the lane I'm turning into. I found it easier to turn right and then make a U-turn into and out of a parking lot a block away. Another pet peeve: those who turn into a two-way left turn lane, and use it as an acceleration and merge lane. No. You pull into it and wait for a break in traffic. Grrrr. Although I think it's somewhat reasonable to accelerate in the lane prior to merging. That's what I usually do. Agreed. I have no problem with the practice. One of my pet peeves is people who pull out into a road from a standstill, so my preference is at odds with ErmineNotyours's. There's a different between using it to accelerate a little once you have a spot to merge into after stopping. Some people, however, treat it like a freeway merge and never even do anything even remotely resembling stopping, continuing down the two-way left turn lane as if it's a travel lane until someone slows down to let them in. If I see a distant gap, what I'll often do is turn into the center lane slowly, drive about 10 mph, and then accelerate up to speed and then merge in. In states that permit merging with the center lane, you'll often find the law permits driving in the lane for quite a while. 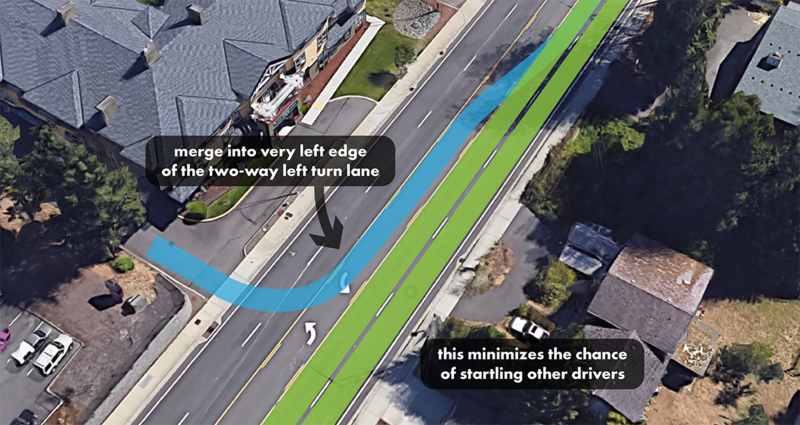 Here in WA, it's 300 feet, as there's an expectation that you'll use the center lane to merge and will need to use it for a little bit longer than if you were just turning left. I very seldom actually turn into the left lane. I almost always use the center lane, even when there's no one around. I turn into it, signal right, and then merge over (though I'm usually in the center lane for a hundred feet or so, at most). I don't like the practice much either, and only do it myself when I've been stuck on the side street for a while. Many states put a statutory limit on the distance you can go in the TWLTL after turning from the side street. I think Nevada is either 100 or 200 feet. Wait, so does it become safer after waiting a few minutes or something? I don't see why you wouldn't do it straight away. This is often how I merge, so I don't freak everyone out, which seems to be the primary issue. On the few occasions where I've gone to turn left as someone decides to merge, I just slow down, let them in (flash my lights), and change lanes behind them as they change into my lane. Nice and seamless. He might be like me, and didn't know that what you describe is a legal maneuver, thus making the "illegal" maneuver only after getting frustrated. TBH it still seems wrong to me to use the center lane for merging into traffic. It's more of a personal preference than anything safety related. Oh I'm very aware it's a legal maneuver (I mentioned that in the full post above). I just don't like it. I know it's not allowed everywhere, though it's certainly ingrained into the driving culture here in the NW. Not doing it gets you honked at (if you hesitate too much); it does help that the law specifically spells it out as legal. Funny how there are some things that are foreign in some states, but completely normal in others. I can understand that theory, though being a glorified cab driver myself, I tend to drive in the most efficient manner at all times (instead of only when necessary). So in the case of TWLTLs, I always merge using them even when no one else is around, mostly so when I need to do it in heavy traffic, it doesn't feel weird. I have certainly seen more than a few drivers who become startled by the maneuver. Sometimes they change lanes to let the person in (even though the person turned left and then stopped to wait for a gap), or slow way down to let them in, under the impression that not slowing down would result in a merge collision (even though the person who turned left, turned into the center lane, not their lane). In either case, however, I've never seen an accident occur. In the hundreds of times I've done it, I've only had one driver honk at me...he gestured at me...I gestured back. Bit childish but whatever. My favorite time to merge into the center lane is when traffic from the right is waiting to turn left into my road, but can't because of a line of cars turning right (from my left). Since they can't go, and the cars from my left are all turning into my road, there's technically no obstacles. Though you have to watch for blinkers if there's no dedicated right turn lane. Especially in this case, it's really important to turn into the center lane, since cars coming from the right that *aren't* turning, aren't necessarily visible behind the left-turning vehicles.